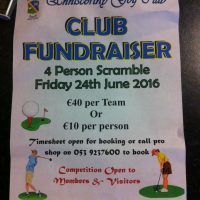 The Enniscorthy Golf Club are holding a 4 Person Scramble on Friday 24th June 2016. 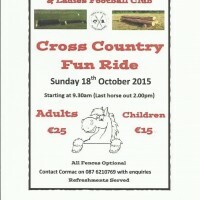 €40 per team or €10 per person. Timesheet open for booking or call pro shop on 053-9237600 to book. Competition open to members and visitors. All proceeds will go toward cost of New Safety Surface on Balcony. Our U12 A Team had some great results in the Tom Kenny Cup Blitz on Saturday 4th July. They had comprehensive wins over Carnew and Ferns. We were beaten in the final by a very strong Askamore Team with a score of 2-5 to 6 points. Great work rate by all the players on the day with great scores coming from TJ Breen, Rory Lacey, Jim Gahan, Darren Kelly, James DeLacey, Eoin Gahan, Joe Ivory, Daniel Rooney and superb long range scores from Patrick Redmond playing at midfield. Our defence were very strong with excellent full back performances from Dylan Brady and Alan O’Neill who were rock solid as usual. Great work rate also from Jason Breen and Eoin Dolan and Fionn Walsh who is back to full form after having a long break due to injury from the Rackard League game. A superb performance from Euan Pender in Goal an U10 star playing for the U12 A team. Great saves and outstanding puck outs landing exactly where wanted every time. 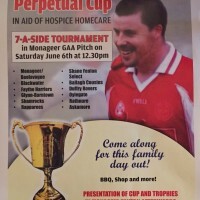 A big thanks to Joe Kenny of Askamore/Kilrush for inviting us to this tournament which was an excellent event. Football Feile Fever has come to an end in Monageer/Boolavogue for 2015. A great weekend was had by all involved. Games started on Friday evening in Ramsgrange against a very strong Kildare team from Eadestown. The opposition dominated the game despite a huge effort from Monageer/Boolavogue. Game ended up Eadestown 2-6 Monageer/Boolavogue 0-1. The second game Friday evening was against St James of Ramsgrange. Two evenly matched teams had a tremendous battle. While Monageer/Boolavogue pulled away at the start of the second half St James balanced the scores by two quick goals. Some excellent long runs and scoring from Aaron Miller and Noel Rowsome secured the win for Monageer/Boolavogue with a final score line of Monageer/Boolavogue 4-6 St James 3-2. Saturday morning started off by playing our visiting team Donaghmoyne Fontenoys from Co. Monaghan on home ground. Donaghmoyne are a strong footballing club who have had huge success at all levels in their county over the past few year. While the visitors had much of the possession in the first half, they were unlucky to concede an early goal from a high ball in that dipped under the crossbar which kept Monageer/Boolavogue in the game. This was an interesting clash of two different styles of football. The visitors played a keep possession, slow build up type of game and the home teamed played a more direct game of running through the defence and taking scores from distance with successful long range kicking come from Aaron Miller and Noel Rowsome keeping the home side in the game . With a minute to go it looked like the visiting team who were a point ahead would be victors but a last minute goal from Daniel Rooney put the home side 2 points up and the gamed ended Monageer/Boolavogue 3-6 Donaghmoyne 2-7. After lunch on Saturday it was off to Blessington to play in the Cup quarter final as Monageer/Boolavogue came second in their group. The game was against a strong football club St Gabriel’s of Galway who had demolished 3 other teams on their way to the qtr finals. St Gabriels proved too strong for Monageer/Boolavogue all over for the pitch and dominated possession and scoring. The game ended Monageer/Boolavogue 0-2 St Gabriels 4-9. St Gabriels went on to have comprehensive wins in both their semi final and final and won the Division 5 cup. Our visiting team Donaghmoyne got through to the Shield semi final in Ballinakill, Co. Wicklow (Wicklow Centre of Excellence) and played Newtown of Wicklow. Players from Monageer/Boolavogue travelled to the venue to support their visiting club. Despite playing the better football and have most of the possession Donaghmoyne missed two goal chances and missed a penalty and unfortunately their Feile 2015 ended with a 2 point defeat. Visit our Gallery for Photo’s of the weekend. Thanks to John Brady for these excellent images. A huge thanks to all who hosted players and mentors and all who helped out over the weekend to make this a very successful event for our club. Thanks also to the Monageer Tavern for providing dinner to all on Saturday. The Biggest Loser Poker Classic will be held on Saturday 21st February 2015 in Monageer Parish Hall starting at 8.30pm. 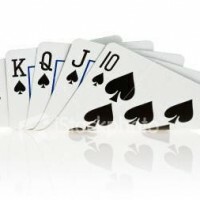 Please round up all card players to make it a big success. On Sunday last a great crowd gathered in the Complex for an information meeting on Nutrition, Fitness & Injury Prevention. Ann Marie Walsh gave a presentation on what we should be eating, i.e. portions and foods suitable to weight control. Kevin Murphy gave a talk on how to keep fit. Ger Dempsey gave a presentation on injury prevention with the help of Austin Codd and Tom Nolan who demonstrated stretches to carry out before and after training. John O Leary brought out a sample of runners and explained the importance of suitable footwear. There was books, recipes & money off vouchers available on the night and there is spares upstairs in the complex for anyone who wish to avail of this information. All in attendance were able to sample some fruit compliments of Lisa Stafford. The Biggest Loser Committee would like to express a big thank you to all who made this night happen and we hope all present took some useful information away with them.